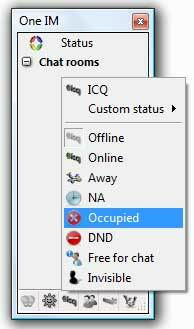 One Instant Messenger is an adaptable multi protocol instant messenger client developed for Windows. The app has extremely little resource requirements being at the same time very fast. One Instant Messenger offers a wide-ranging support: AIM, ICQ, IRC, MSN and Jabber, but it also employs a plug-in system that makes possible the inclusion of other popular instant messaging protocols such as Gadu-Gadu, Netsend, Skype, Yahoo and more. Moreover, you have the ability to use additional features like Clock, Weather and RSS Feed Reader. The versatility of this application extends to being portable, allowing you to run it from a USB flash drive or other similar removable storage devices.You can choose to increase the functionality of this program at any time downloading a plethora of other free plug-ins. One Instant Messenger doesn't require installation and is highly customizable when it comes to skins, sounds, icons and other options that let you change it to your liking. NOTE: The application is offered free of charge! 2014-01-06 3.5.0 Fast connection. Added new services.